One of Namco’s most enduring coin-op arcade game franchises has returned for the iPhone and iPod touch — Dig Dug Remix is now available, and costs $6. 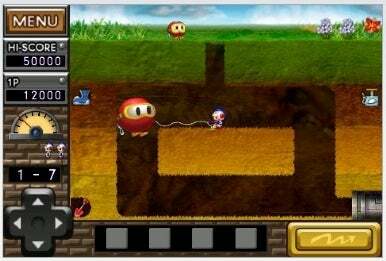 Dig Dug Remix includes the original arcade game and an updated game with new graphics, boss battles and more. Dig Dug Remix is a revisitation of the classic arcade game in which you must mine underground territories while taking on enemies like Pooka and Fygar, filling them up with an air pump or using your cave-digging skills to drop giant rocks on their heads. The game includes the original version of Dig Dug, just like you remember it from the arcades, along with Dig Dug Remix, a new “remixed” version with fresh features like updated graphics and gameplay, big boss battles, power up items and more. It’s similar to what Namco has recently done with Galaga Remix. Dig Dug Remix requires iPhone 2.2.1 software update.